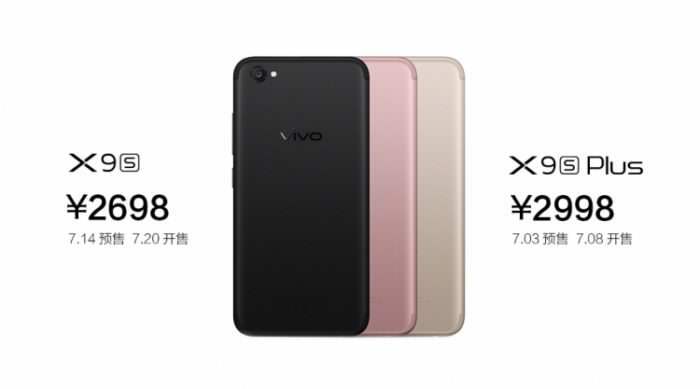 Vivo has launched two smartphones – X9s and X9s Plus in China. Both new smartphones feature similar design language and highlight the dual selfie camera setup. These two devices come in three color variants of Matte Black, Gold, and Rose Gold, and are priced at 2698 yuan and 2998 yuan respectively. The Vivo X9s and X9s Plus, both runs on Android version 7.1 Nougat out of the box, which is based on FunTouch Operating System 3.1 and it supports a dual-SIM slot. There is a slight difference in its display size as Vivo X9s features a 5.5-inch full High Definition panels whereas, the Vivo X9s Plus has 5.85-inch full-HD AMOLED display. In terms of processor, Vivo X9s is powered by Snapdragon 652 octa-core processor. On the other side, Vivo X9s Plus is powered by a Snapdragon 653 octa-core processor. However, Both the smartphones are coupled with coupled with Adreno 510 GPU and 4GB of RAM, and offer 64GB of inbuilt onboard storage that can be extended further via micro SD card of 256GB. As for the dual selfie camera setup, both Vivo X9s and X9s Plus have a primary 20-megapixel sensor and secondary 5-megapixel to capture depth. The rear camera sports a 16-megapixel sensor with LED flash and PDAF. The Vivo X9s packs a smaller size of 3320mAh battery compared to the Vivo X9s Plus, which houses a larger size 4015mAh battery. Though, both are non-removable and support fast charging. Connectivity options include 4G VoLTE, Wi-Fi 802.11ac, GPS, Bluetooth v4.2, Micro USB, USB OTG. Vivo says that the registrations for X9s opens July 14 and the sale will commence on July 20. There is no information on the two smartphones coming to India as of now.